Saturday we took a Shinkansen to Odawara. I can’t stress enough how wonderful the Shinkansen experience is. It’s insane that we do not have this option for travel in America. I travel to Oakland for work often and I’d much prefer to take a high-speed train than take a southwest flight. Remove the time of checking in at the airport, boarding, deplaning, etc. and the train would actually be faster (if we can make them as fast as Japan does). After the shinkansen, we took local trains and buses to Hakone, a small town nestled next to Lake Ashi with a view of Fuji-san. Or at least that’s what the internet said. 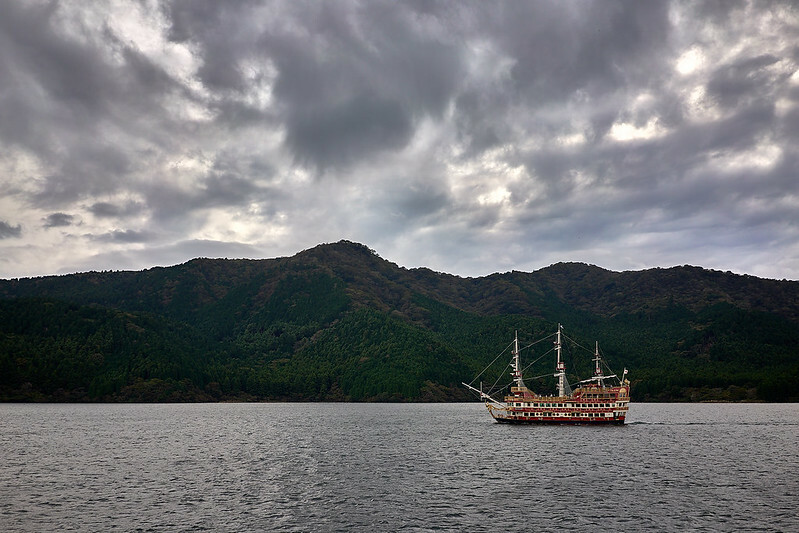 Even though clouds covered up the mountain we still took the pirate ship lake tour en route to the ropeway. Just like they traversed the lake five hundred years ago…or something. The sulfur gases escaping from the mines adjacent to the tourist trap on the top of the mountain in Owakudani stung our eyes and noses. 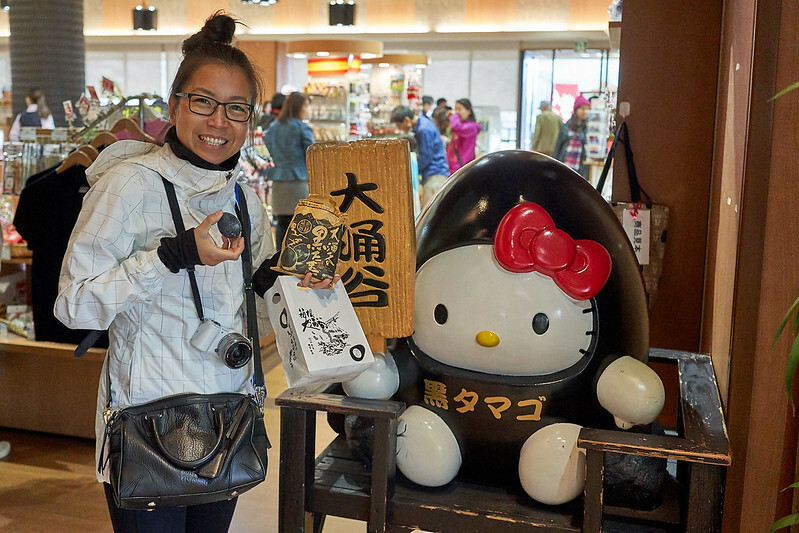 All a ploy to get you into the souvenir shop, right? The main draw inside: black eggs. Don’t worry, they weren’t like balut or anything. The clouds never cleared and we went back to the Inn a little disappointed. The inn turned out to be the only place to eat (I guess nobody actually stays in town at night like we did) after dark so the Innkeeper chatted us up while we ate. Yes, this was where the Trump questions came during the trip. Or rather, the Trump proclamations. The Innkeeper noted that Trump has asked Japan to buy American cars. Looking around the streets it became obvious what a joke that idea is. At a time when Ford is discontinuing the manufacture of its small cars, the president is asking a country that only buys small fuel efficient cars…to buy giant gas guzzling american cars. Other than that interaction (which was otherwise pleasant) it was nice to not have to think about the blind, deaf, and dumb bull in the china shop back home. But Fuji isn’t the only thing to see in Hakone. 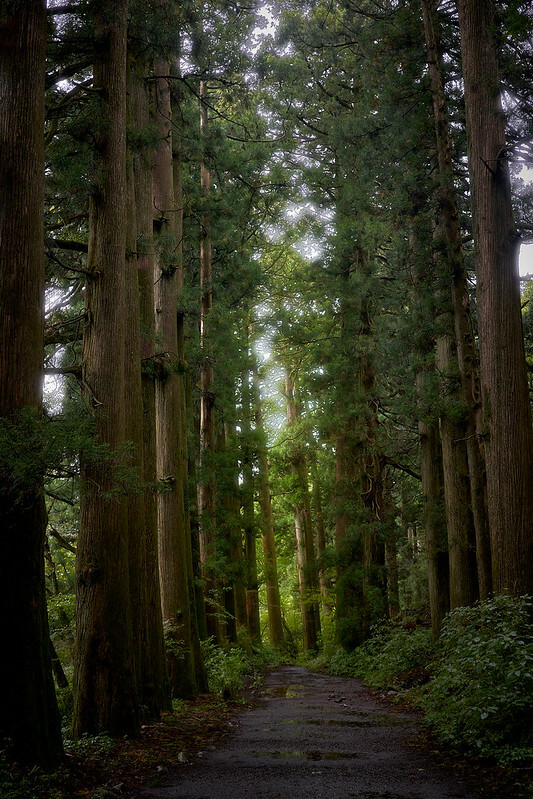 The next morning we braved the rain to walk up the street to Onshihakone Park and then continued on to the more famous Ancient Cedar Avenue. This is not a pic from Oregon, I swear! Even more famous than the short walk through old trees is what they’ve done with a few of those trees and some red paint. 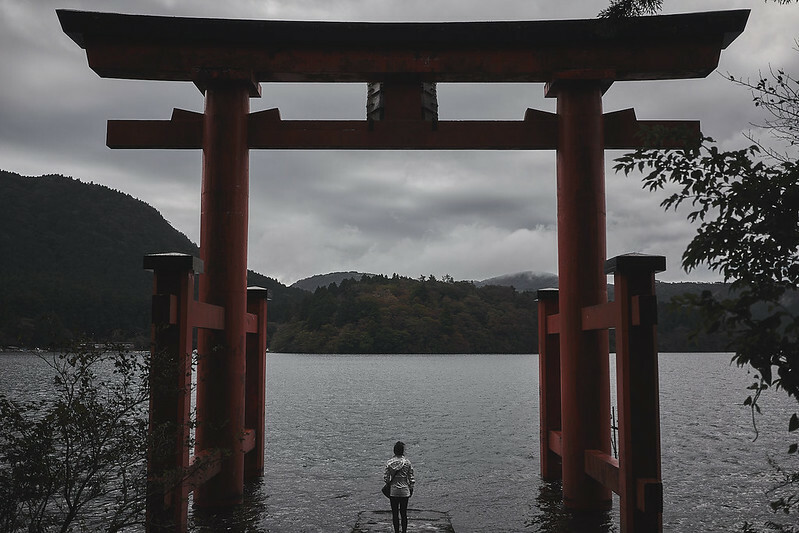 Seen in many photos and videos a giant Torii “Gate of Peace” sits literally in the lake’s edge a staircase below Hakone Shrine. This gate served as the turning point in our trip. From there we took a bus back to the Inn, a bus to Odawara, and another Shinkansen to Tokyo to meet up with six members of Sam’s family.